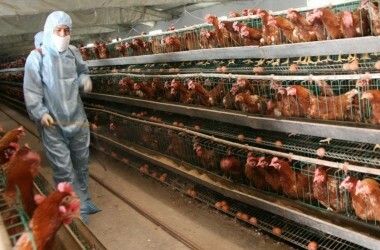 25Coccidiosis in one of the major menace for poultry industry causes heavy economic losses world wide. The disease is commonly called as Red Dysentry (Khuni pachish). Coccidiosis may be Intestinal or caecal caused by intracellular protozoa, belonging to the genus Eimeria (Phylum Apicomplexa). The disease is characterized by bloody diarrhoea, emaciation, ruffled feather and loss of apatite. More or less about 300 species of genus Eimeria has been known and recorded in birds and mammals. It is estimated that the economic losses due to the disease are about US$ 450 million and due to medication are about US$ 100 million in the United States. In countries like Pakistan, where the farming is substandard, the disease becomes more serious and causes heavy economic losses; although the exact losses due to coccidiosis in Pakistan are not known due to the lack of statistical indices but these will be definite in million of rupees. Seven species of genus Eimeria (E.) including E. tenella, E. acervulina, E. maxima, E. necatrix, E. mitis, E. praecox and E. brunetti are generally accepted to be the causative agent of avian coccidiosis. E. tenella and E. maxima are considered to be the most important to the poultry industry from consideration of their ubiquity in broiler chicks, innate pathogenicity and immunological features. In Pakistan E. tenella is the most prevalent and pathogenic species. The conventional methods to control the disease are by using certain coccidiostats/coccidiocidal drugs, but in-discretionary use of anticoccidial drugs including monensin, amprolium, ionophores and nicarbazin has resulted in the emergence of drug resistant strains, which has reduced the efficacy of many of the currently used coccidiostats. During the recent years, pharmaceutical industries throughout the world have not marketed any new anticoccidials. Obviously an alternative system to control the disease is by vaccination. Time to time different attempts have been made to immunize the chicks against coccidiosis throughout the world by using different antigenic materials including low doses of sporulated oocysts , irradiated sporulated oocysts, sporozoites, merozoites, recombinant vaccine, recombinant refractile body antigen and inactivated sporulated oocysts. But none of the experimental vaccine reached to commercial scale up to 1980. In late 80’s and early 90’s, Immnocox, Paracox and Livacox was developed and are being marketed now in different countries including Canada, Bangladesh, Scandinavian countries, India, Pakistan and European countries. Immunocox is also available commercially in Pakistan although it is not used routinely in the commercial flocks due to disease occurrence even in the vaccinated birds; the vaccine failure may be due to the strain variations. a. Adaptation of E. tenella (local isolate) on the chicken embryos. b. Formulation of vaccine(s) from egg-adapted gametocytes. c. Evaluation of vaccine(s) on the basis of, mucosal, cellular, humoral and challenge responses. Keeping in view, successful attempts were made in the adaptation of E. tenella, the most pathogenic species, on the chicken embryos.Life cycle of E. tenella sporozoites was established on the chicken embryos on chorio-allantoic membrane. It completed its life cycle in 6th-7th days. Sporozoites were injected into chorio-allantoic membrane of ten-days-old chicken embryo. Mature and immature schizonts were seen in CAM on day 4, 5, 6 and 7, and numerous merozoites were observed in the chorio-allantoic fluid. Gametocytes and Oocysts were also found in Chorio-allantoic fluid (CAF). Gametocytes and oocysts were detected in CAF 6th to 7th days post inoculation of sporozoites. Gametocytes (macro & microgamets) were obtained in the CAF. During that period, 2% death in embryo was observed from day 1 to 4th that may be not associated with parasitaemia and due to the toxic substances From day 5th to 7th, 60.8 % embryos were found dead and 34.4 % embryos were found alive. Enormous numbers of gametocytes were produced after the inoculation of sporozoites into the CAM. These egg adapted gametocytes were used in the vaccine(s) formulation viz vaccine-I (gametocytes), vaccine-II (gametocytes inactivated with formalin) and vaccine-III (inactivated sonicated gametocytes) and were given orally to immunize the chicks. The gameyocytes vaccine(s) were evaluated on the basis of cellular, humoral, mucosal and challenge responses. All the vaccine(s) gave protection against heavy doses of infection of mixed species of coccidia. Cell mediated immune response of the vaccinated and control Groups was detected by splenic cell migration inhibition assay and results were expressed interms of migration index calculated from cellular migration distance from the edge of fragment with and without antigen. On day 5th and 15th post vaccination, there was significant difference (P<0.01) in migration index of all four Groups with antigen and non-significant difference without antigen. This indicates that the test antigen has triggered the T-cells; to initiate the cell mediated immune response. Humoral response in chicks vaccinated with gametocytes vaccine(s) was detected by indirect haemagglutination test and results were expressed interms of geomean antibody titre. A non-significant difference (P>0.05) in geomean titer among Vaccine I, Vaccine II, Vaccine III and control Group at day 15th post vaccination was recorded. On the other hand, the difference (P<0.01) in geomean titer among Vaccine I, Vaccine II, Vaccine III and control Group was significant on day 21st post vaccination. IgA, IgG and IgM play vital role in the binding of foreign antigens and the presence of these antibody molecules on a microbial or parasitic surface can cause clumping (agglutination) and among them IgG activates the complement system. In the present study, Enzyme linked immunospot (ELISPOT) assay was used to detect the IgA, IgG and IgM antibodies producing cells in chicks vaccinated with gametocytes vaccine(s) against coccidiosis. There was significant difference (P>0.05) of IgA antibody secreting cells of Group III with Group II and I and non-significant difference (P>0.05) between Group I and II. Significant difference (P>0.05) of IgG antibody secreting cells of Group III with Group I and II and non-significant difference (P>0.05) between Group I and II was recorded. Similarly significant difference (P>0.05) was also recorded of IgM antibody secreting cells of Group III with Group I and Group II and non-significant difference (P>0.05) between Group I and II. Results of the present study revealed that spleen is one of the major sources of cells producing IgA, IgG and IgM secretors. IgA and IgM antibody secreting cells were maximum in Group III followed by Group II and Group I. IgG antibody secreting cells were also maximum in Group III but numbers were equal in Group II and Group I. Such a high level of immunoglobulins secretors in Group III (inoculated with sonicated formalized gametocytes vaccine) indicate the synthesizes of Major immunoglobulins particularly IgA and IgG that has a major role to prevent adherence of coccidial parasite to the body of the host. From the ELISPOT assay results it may be concluded that Vaccine III gave better protection followed by Vaccine II and Vaccine I. Challenge experiments were also conducted to evaluate the gametcyte vaccine(s). For this purpose, oocysts of mixed species of genus Eimeria were used to challenge the vaccinated and control birds. There was non-significant difference (P>0.05) in oocysts count between Group I and Group II while the difference of Group III was significant (P>0.05) with Groups I, Group II and Group IV. Chicks mortality in Group I was significantly higher (P>0.05) as compared to Group III and control Group IV but mortality difference was non significant different (P>0.05) between Group-I and Group II. Results of the challenge experiments showed that the Group III gave vaccine III resisted to heavy dose of infection. There was non-significant difference (P>0.05) in lesions score of Group I, Group II and Group IV. Lesions scores in Group III were significantly different (P>0.05) from Group I, Group II and Group IV. Lesion scores were found to be directly proportional to the mortality and oocyst count per gram of faeces/droppings but inversely proportional to the percent protection and level of the immune responses. It was also observed that mild to moderate lesions produced despite of immunity conferred which reflect that the organism has multiplied but may not lead to fatality to cause the disease or mortality. On the basis of cellular, humoral, mucosal and challenge responses, Vaccine III (inactivated sonicated gametocytes) was found to give better results as compared to Vaccine II (gametocytes inactivated with formalin) and Vaccine I (gametocytes). Further studies on the molecular characterization of egg adapted gametocytes antigen to identify the candidate antigen and its feasibility on commercial scale.